Stinson & Company is locally owned and operated. We specialize in the sale of Gold & Silver Bullion, Jewelry, Diamonds, US Coins & Paper Currency, Antiques, Collectables, Vintage Guitars and many other items of value at the fairest prices. You will always find some of the most interesting items from week to week. 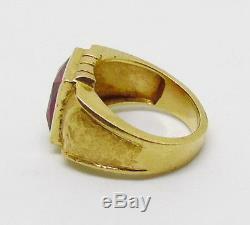 Mens Vintage 18k Solid Yellow Gold Square Synthetic Red Ruby Ring 12.2grams. 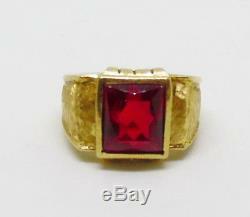 Up for sale today is this Mens Vintage 18k Solid Yellow Gold Square Synthetic Red Ruby Ring. This is a great looking mens ring with brushed finish head and sides. 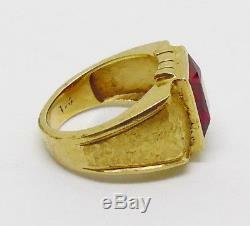 The center synthetic ruby measures 11mm x9mm and is a modified square princess cut stone. The ring weighs in at 12.2grams. Of solid 18k yellow gold and is sized to fit a 9.75 finger. Please make note the stone is a little loose but is still very secure. If you put it to your ear and tap it with your finger you can hear a slight rattle. Listing and template services provided by inkFrog. 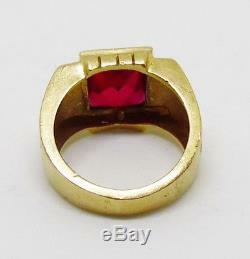 The item "Mens Vintage 18k Solid Yellow Gold Square Synthetic Red Ruby Ring 12.2grams" is in sale since Tuesday, March 13, 2018. This item is in the category "Jewelry & Watches\Fine Jewelry\Fine Rings\Gemstone". The seller is "stinsoncompany" and is located in Portland, Maine. This item can be shipped to United States.